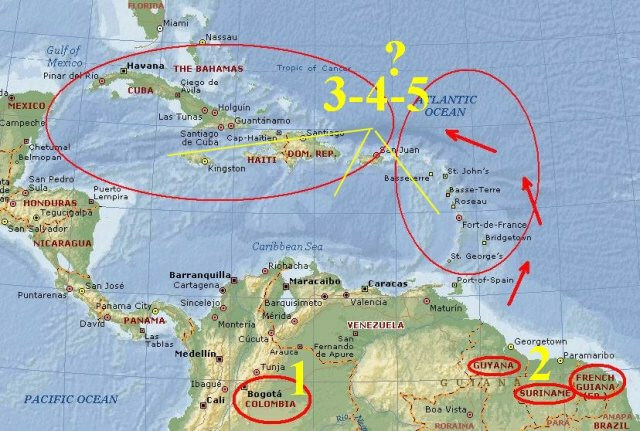 Ok, first, I am learning, you spell Caribbean with one R and not two, so I am half way to the Caribe as I think way it in Spanish and I am not sure about French. I believe the Spanish and French influence is strong; however, there are probably too many rich folks from the USA playing in the Caribbean, spelled with one R and with two B’s. I will fly to Bogotá, Colombia of the 11 of January, then talk with German at the Platypus Bogotá Hostel. He as traveled 15 years, and now is the owner of the Hostel there. I am sure he can give some insight into how to jump from Venezuela or Colombia to the Suriname, Guyana, and French Guyana area. I expect Caracas, Venezuela to be the pivot point or Airplane gate for the region; it may be also that Miami Florida is a better gate. A plane fare is not the same as a train or bus trip. It often is easier and much cheaper to take the long way there. I can hop from Caracas to Miami for about 150 U.S. Dollars, and there are probably many channels to choose from to go to anywhere in the Caribbean. I suppose if I wish to be some form of purist I can say to myself, I can only do boats. I am not sure if this is a challenge or not, I know that taking a cruise of paying for sailing boat is not a challenge. Something random is a challenge, planned is easy, expensive is easy. Who knows, there is Chris a guy in Puerto Rico presently, I am sure he has sussed out some of the ins and outs. My gut says the best way to travel the Caribbean is probably bouncing off Miami, Caracas and Mexico City to the Islands and doing well-worn paths. There are always paths of travelers. For instance, there is a path from Holland to Curacao to Suriname. Most paths to American lead you through either Miami Florida or Houston. Most paths leading to the Caribbean lead or start in Miami, I believe, not positive but pretty sure. 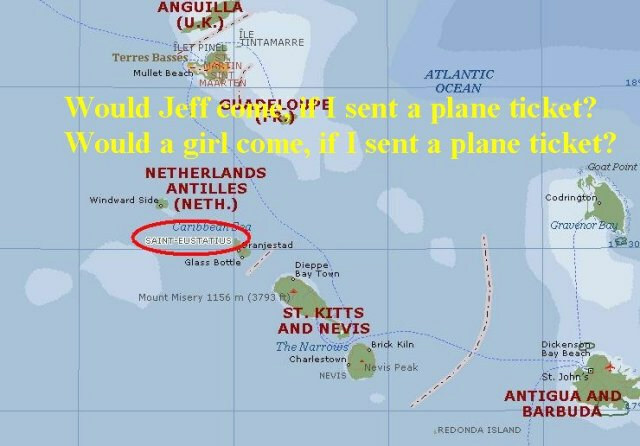 My friend Jeff said he would come to the Island of Eustatius if I sent him a plane ticket. This is a college buddy and very tempting, I have not had his undivided attention in 10 years, it would be nice to kidnap him from his cage, he is caught in the Banker, Corporate, I want to have two children, big house thingy. I am hard pressed to know if any of my friends are gut level happy. They seem to be resigned to their fates. Met a guy last night that wants to hunt Lions with a Bow and Arrow in Africa, I can tell he has mentally figured it out to a high degree, however I think he will excuse himself to death until he dies and never does it. I am thinking about the guy Richard from the Senior Bachelor thing, he is offering free trips to women who win or want to win to travel around the world with him. I am thinking, just about walking up to women and just offering… hehehe.